We hope you enjoy our web presence where you will discover a little more about our history, our artists, the artwork and the full range of all that Rivers of Silk has become. 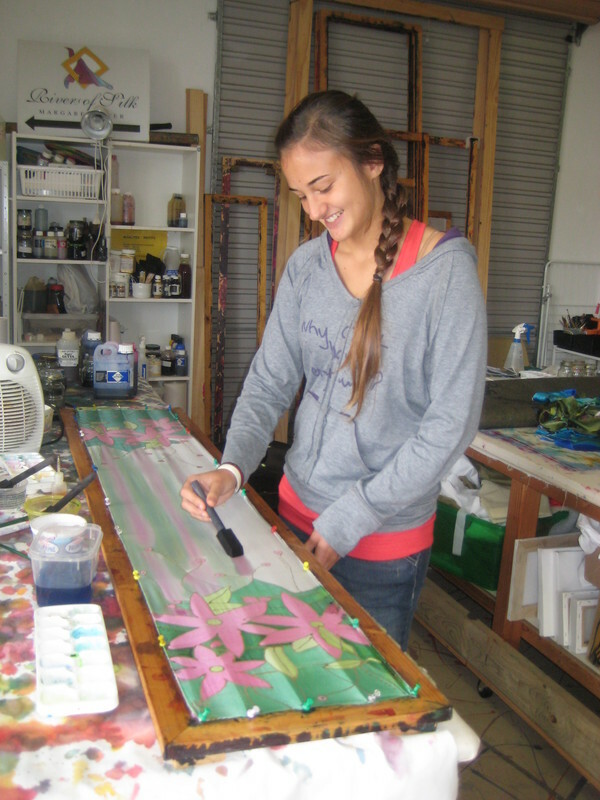 From humble beginnings we now work from a dedicated workshop and are able to share so much of our many years of practice in the world of silk art. Visit our Gallery to view the images of the art pieces produced in the studio. This shows historic pieces as well as a range of works that are available to adorn your personal space. The Rivers of Silk Studio has always been about sharing. There is great joy to be had in the shared creative energy of people. My mission has always been to create an environment where people can feel comfortable to play again, and be delighted with the results, so we keep it simple. We specialise in individual and group workshops, so if you're thinking of: discovering your creative side; learning some empowering and successful techniques; treating a friend or family member; or just want to gather with a group to have some fun, visit our Workshops page for all the details. Sign up for our e-newsletter below or like us on Facebook! and be sure to keep up with the ongoing events in the studio and beyond.